It's a big weekend in football. We find out who will play in the Super Bowl in a few weeks! Are you planning on watching the games? We definitely will be watching. We will also be eating these delicious Beef & Cheddar Sliders! 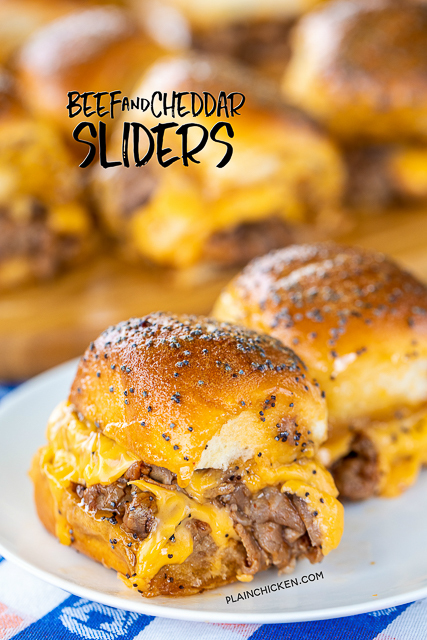 Roast beef, BBQ sauce, cheddar cheese and a sweet and savory glaze on top. YES!!!! 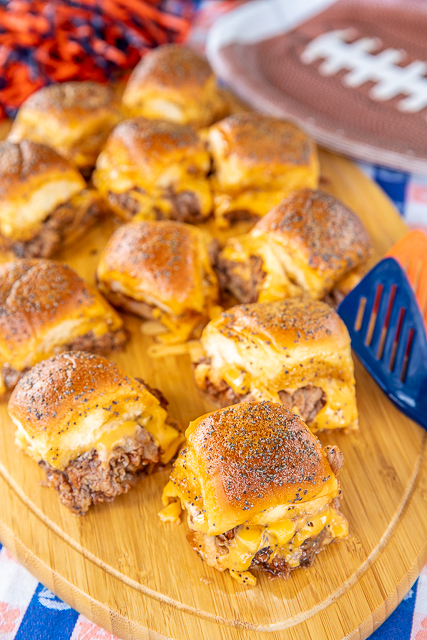 You can assemble these Beef & Cheddar Sliders ahead of time and refrigerate until you are ready to bake. 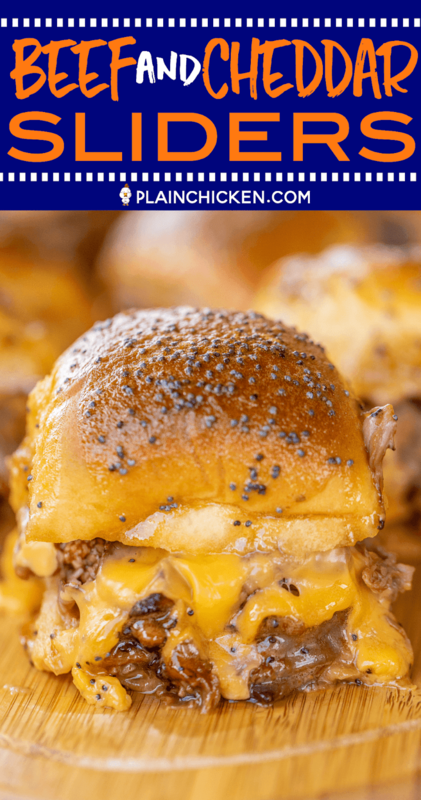 I would wait and pour the glaze on top of the sliders until you are ready to bake. 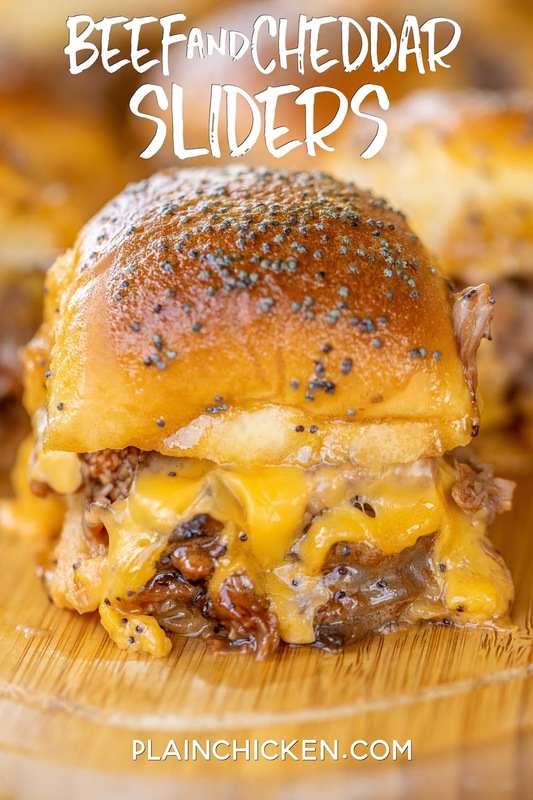 The sliders might get soggy otherwise. The glaze only takes a minute to whip up. 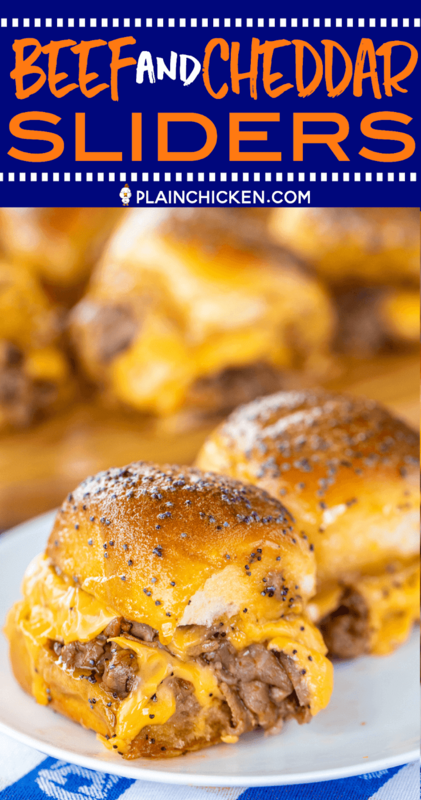 Preheat the oven, heat the glaze, pour over the rolls and bake. Easy peasy. 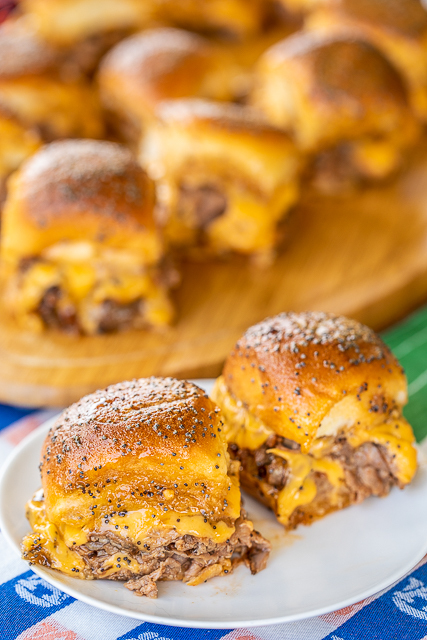 We LOVE these Beef & Cheddar Sliders. We've eaten them several times over the past few months and just can't get enough of them. We love the flavor combination!!! Toss thinly sliced roast beef with bbq sauce. Split each dinner roll. Place roll bottoms in 9x13x2-baking pan. 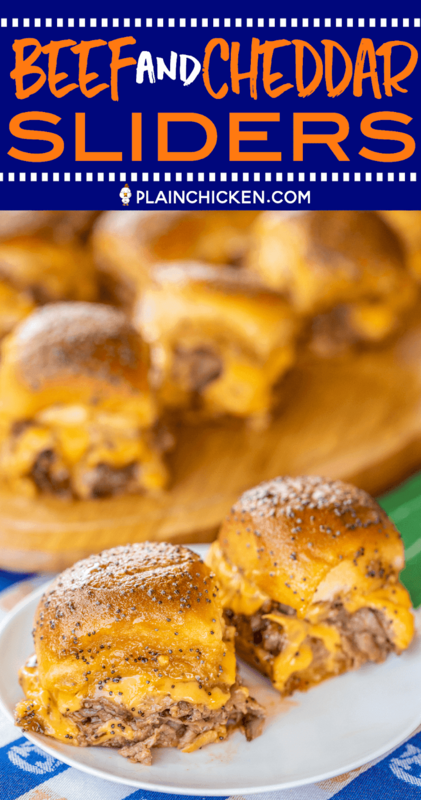 Top rolls with bbq roast beef. Top roast beef with cheese slices. 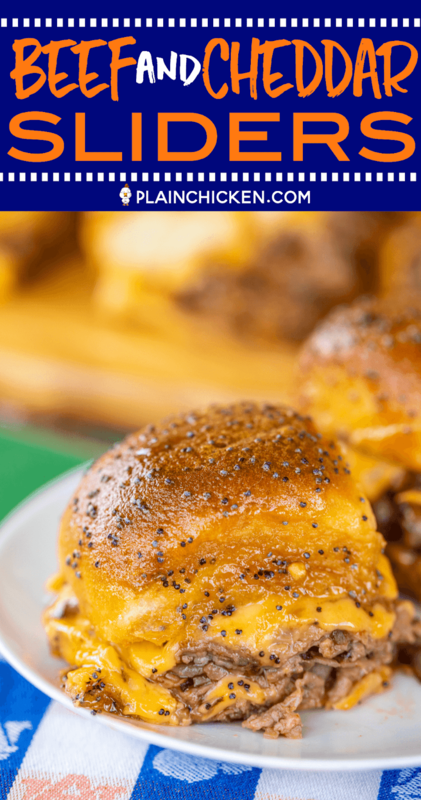 Place roll tops on top of cheese. In a small sauce pan combine butter, brown sugar, mustard, Worcestershire and poppy seeds. Bring to a boil and pour over sandwiches. Bake for 20-30 minutes, or until the tops are brown and crispy. 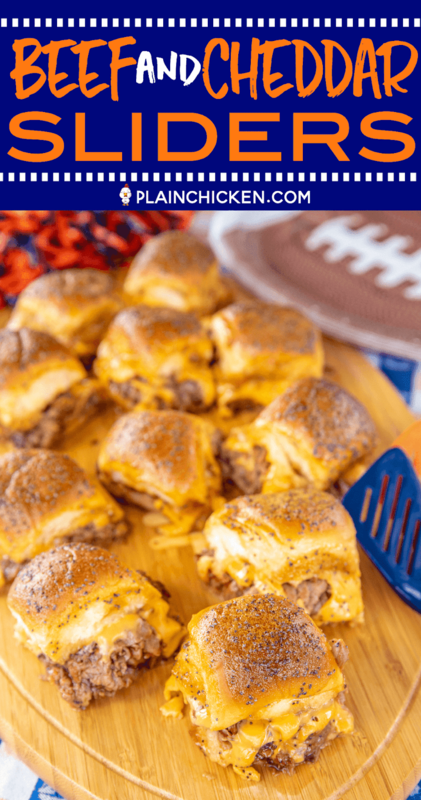 Oh I can't wait to make this for the super bowl! i would have never guessed it was deli meat! Cooking now during the Rams vs. St. game going into OT! 1/20/19. Do the rolls get soggy on the bottom?